Note: At the time of posting this review, the domain Impex-Services.org was offline. We have decided to still post it because it contains information regarding the owner of this scam operation. Moreover, scam sites are known to disappear and re-emerge on different domains. Please let us know if you have been scammed by Impex Services, or if you are aware of a different domain used by these fraudsters. A rather brittle cryptocurrency investment platform has entered the Bitcoin fold. As you can infer from the title of this review, we are referring to Impex Services, which is hosted at Impex-Services.org. Exemplifying all the usual symptoms of a Ponzi scheme, we will be conducting a thorough investigation into the Impex Services platform with the aim of concluding whether or not this investment destination is legitimate or just another scam. Impex Services is a web-based platform tailored towards crypto investors who are searching to conduct passive, stable and most importantly safe income. Impex Services does not operate like a traditional investment brokerage when investors are given control over their funds, but instead in an operational atmosphere where their team of “financial professionals” control all deposited bitcoins and manage them for you. The amount you initially deposit will dictate which investment package you are eligible to enroll in. What does Impex Services Offer? Impex Services portrays their site as an online platform that will professionally manage the deposits of investors and offer lucrative returns. Investors who deposit into their platform seize all control over their deposited funds while, allegedly, their team of professionals will invest your funds for you. Whether these financial professionals are licensed or not, we are unsure but we highly doubt it. It should be be known that the only deposits accepted through Impex Services would be bitcoins. The values that you see regarding the deposit requirements must be met via Bitcoin. The returns promised through Impex Services are not only unrealistic but completely unbelievable. Promising returns between 192.5% to 480.5% in just over a month is ridiculous at best and completely unsustainable in any operational model. 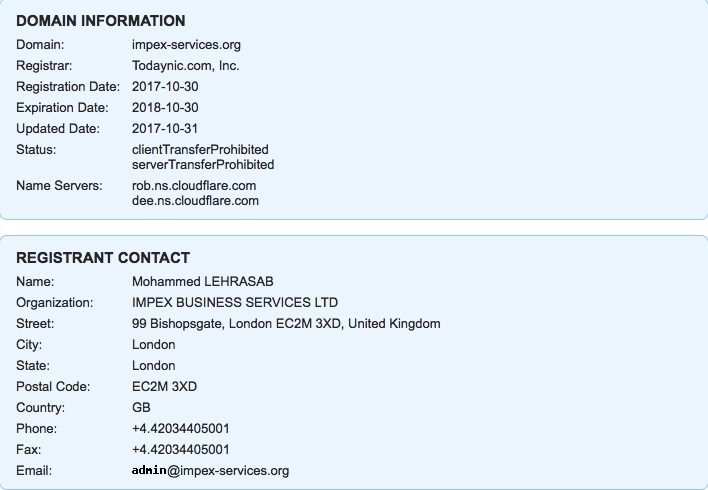 A WHOIS report will reveal to us that Impex-Services.org is a new site that was created on October 30th, 2017. The registrant behind this domain is Mohammed Lehrasab while the site was registered through Todaynic.com, Inc.
Is there information regarding the owners behind the site? We are confronted with yet again another too good to be true operation that employs the usual UK company model. Allegedly owned and operated by Impex Business Services Ltd under file number 08220710, this corporate entity was incorporated on September 19th, 2012 according to a CompaniesHouse report. Whether or not Impex-Services.org is actually operated by this corporate entity we are unsure due to the large time variation between the domain and corporate entity. Regardless, it has become common practice for suspicious investment platforms to employ these vague UK companies as their own corporate entity in the attempt to build and solidify investor confidence. Does the site employ an evasive operational model? For the most part, yes. Impex Services is straightforward regarding their ROIs and alleged corporate entity but they are evasive regarding other aspects. Not disclosing whether or not their investors are licensed, whether or not their platform is overseen by a regulatory entity or which channels their financial professionals invest through are significant areas that should be disclosed upon their site. No legitimate sites have been shown to share a backlink or affiliation with Impex-Services.org. Impex-Services.org had a SimiliarWeb global rank of 2,156,740 as of December 12th, 2017. This report indicates to us that Impex Services is not a popular investment destination and their goal of reaching 300,000 investors by the end of 2017, as predicted on their site, is far from coming true. Impex Services comes off as a zealous investment platform that has much to offer prospective Bitcoin investors. Unfortunately, further investigative work into the dismal components of this operation will reveal a more deceptive nature. Offering ROIs that reside outside the realm of plausible, it is only a matter of time before Impex Services turns into a bona fide Ponzi scheme. Our advice would be to give Impex-Services.org a wide berth and only invest with platforms that are verified and don’t offer far-fetched returns. Review Verdict: Impex Services is a SCAM! Searching for a verified and legitimate investment opportunity? We encourage you to browse our Crypto Investment Guide to educate yourself about genuine investment platforms that are tailored towards your investment goals. Please share any thoughts, feedback or experiences you may possess by leaving a comment below!